Please Note: What follows is only an excerpt from the actual article published by Traditional Home. Atlanta builder Lynn Womack has designed and built many homes since starting his construction firm 12 years ago, but among those of which he is proudest is the house above, which he built for his own family. It's design is loosely based on the work of the late James Means, an Atlanta architect who specialized in period reproduction homes, but Lynn and his wife, Cheryl, an interior designer, planned the house to accommodate their family's informal lifestyle. 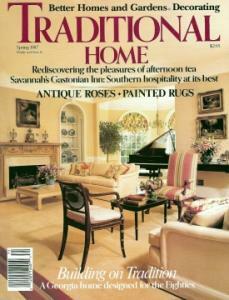 Join us as we tour the Womack's home on the pages that follow. An elegant home in every sense of the word, the Womack house bespeaks the graceful styling that has distinguished grand Southern homes for more than 200 years. While such graceful styling often typifies older homes, it is not commonly seen in those of recent vintage. That the house is so beautifully designed and detailed his to the credit of Lynn and Cheryl, who both possess a deep appreciation of traditional design and a superb flair for detailing. Yet as both are quick to point out, their primary concern was not to design a showplace, but to create a home that would be comfortable for them and for their daughters, Alison, 13, and twins Brandy and Lauren, 7. "We wanted a home that would have a look of period authenticity about it but would also have a very comfortable feel to it," Cheryl said. "We are not a formal family and we didn't want to live in a home where the rooms are never used and people are free to touch anything. The one concession we made [to formality] was the dining room. There are times when we enjoy formal entertaining, in this room was designed for that purpose." Although the architecture appears to be based on an 18th-century design, it is largely of Lynn and Cheryl's invention. The basic design was inspired by a plan of the late James Means, an Atlanta architect noted for the reproduction homes he designed from the 1920s through the 1940s. "We liked the basic look of Means' design," Lynn says, "but the design that evolved is really our own. We had a lot of ideas about how we wanted the house to look and we played with them and played with them until we felt we had what we really wanted." At the heart of the symmetrical scheme is a two-story foyer, opposite, that rises to a second-floor sitting room. Originally the upstairs space was used as a music room, but Cheryl had the piano moved to the first-floor family room so she could better hear the girls practiced their music. The chandelier hanging in the foyer was retrieved from an old home in Charleston, South Carolina, and although the banister and balustrades are new elements, the newel is an architectural antique purchase locally. The most exquisite architectural detailing in the house is found in the first-floor study, right, where gleaming walnut paneling and rich cherry flooring provide a perfect foil for the antique furnishings and accessories. 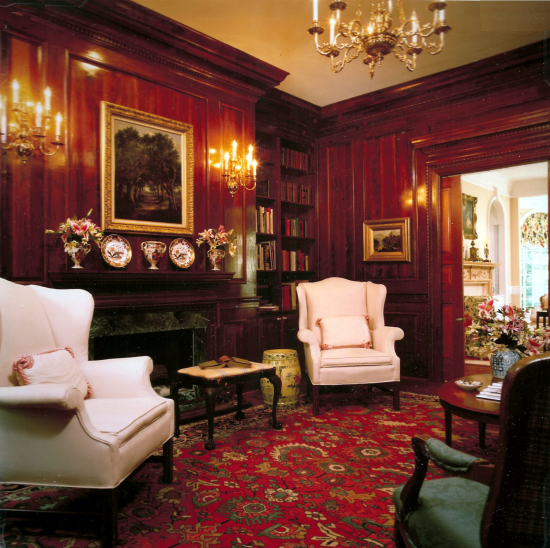 The old English paintings in this room are among Cheryl's favorites.